Offer peace of mind on the open water. Whether a weekend cruiser or a yacht owner, your customers rely on you for watercraft coverage that does more than just provide liability. American Modern’s program checks all the boxes including collision, comprehensive loss, plus options that can extend the coverage even further to include the trailer or boat lift, towing, personal effects and more. In some states, we offer a special program just for yachts. Even a Jet Ski® or Wave Runner® may qualify for protection under our personal watercraft program. Navigation American Modern covers the boat in all waters of the U.S. and Canada, plus Mexico’s Pacific coast (north of Rio Santo Tomas, Baja), the international shared lakes between Mexico and Texas, and optional navigation to the Bahamas. Fishing gear/personal effects – Coverage starts at $5,000 and can be increased to $10,000. Consequential damage – Damage or loss claims are not automatically denied because the originating cause is not insurable, such as a bilge pump failure. Damage from under/uninsured watercraft – Covered up to an amount equal to the liability limit. Emergency assistance and towing – Reimbursed up to $350/occurrence ($1,500/term) and can be increased. Haul out coverage – Accidental spill pollution. Liability extension – Your policy’s liability provisions apply when someone else’s watercraft is rented or used. Medical payments – Policy includes $1,000 of coverage, which can be increased up to $25,000. Trailer or boat lift – Add physical damage coverage for a trailer designed to transport the insured boat or the lift to take it out of the water. Watersport liability – Add protection beyond general liability. Required for ski boats. Q: Can this round out strategy help me on the coast? * If the boat is located in Florida’s Dade, Broward, Monroe or Palm Beach counties, it is ineligible for the American Modern Boat Program. Houseboats up to 125 ft are eligible if newer than 15 years and moored in fresh waters. Q: What valuation options are available in the American Modern boat program? A: The standard policy includes Agreed Value Coverage for boats new to 10 years and Market Value (ACV) for boats 11 years and older. Total Loss Replacement Cost is available for units new to 3 years old, Extended Agreed Value is available for units over 11 years and Market Value can be provided for boats new to 10 years old. Q: What are the navigation restrictions under this program? A: Navigable territories include the inland and coastal waters of the United States, Canada, and the Pacific coastal waters of Mexico no farther south than Rio Santo Tomas, Mexico. Navigation limits also allow for use in Mexico lakes as long as the lake is shared between the US and Mexico and the boat is moored in the US. Please note that with the exception of the countries noted above, navigation into the territorial waters of any foreign country is prohibited. Q: What types of boats are accepted in the American Modern boat program? 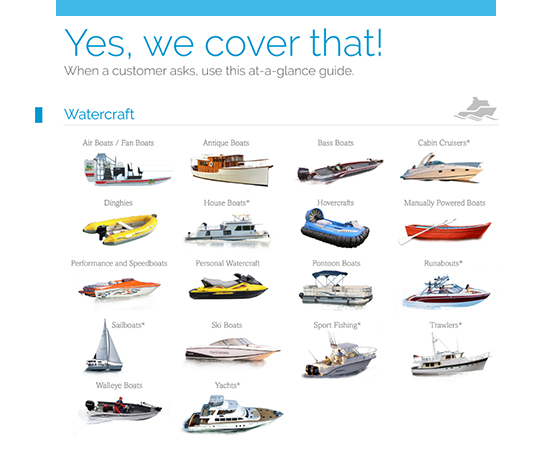 A: We accept powerboats, sailboats, trawlers, pontoons, sport-fishers, airboats, hovercraft and houseboats. Q: What is the maximum length of watercraft accepted in the American Modern program? A: The maximum length is 64 feet for all watercraft with the exception of houseboats. Houseboats up to 125 ft are eligible if newer than 15 years and moored in fresh waters. Q: What is the maximum speed acceptable in the American Modern boat program? A: The maximum allowable speed for all boats, except bass boats, to is 120 miles per hour. Bass boats will be restricted to 90 miles per hour*. * Bass boats should be written in the Allstate Program, if otherwise eligible. Q: What is the maximum hull value acceptable in the American Modern program? A: The maximum hull value accepted is $500,000. Q: What is the maximum limit of liability available in this program? A: The maximum liability limit available is $1,000,000. Q: What are the Advantage, Advantage Plus, Yacht Plus and Professional Angler endorsements? A: The Advantage, Advantage Plus, Yacht Plus and Professional Angler endorsement allow your customer to add important coverages at an affordable price. What other optional coverages are available in the American Modern boat program? Q: What discounts are available in the American Modern boat program? Named Storm Exclusion endorsement – for customers in East and Gulf coastal territories who are interested in a money saving option. See Underwriting Guidelines for discount eligibility.